Guardian Angel Publishing was generous enough to send six different stories, in ebook form. I'm going to do a quickie review of each, in the order we used them. "Genevieve's hill was as tall as a castle spire. She climbed right to the top. Rain splattered her face. The clouds were heavy and grey, like the belly of a sleepy kitten." This was a fun, fun story. 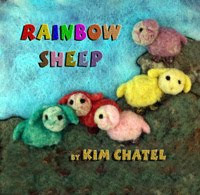 And I want to try felting with the directions given after the story. 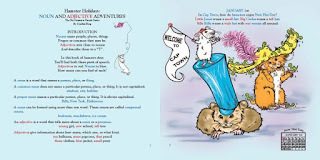 Next was Hamster Holidays by Cynthia Reeg. This is a wacky story about holidays celebrated by hamsters, and it is explicitly meant to be used to teach nouns and adjectives. But each page of the story also includes a calendar, as there is a holiday for every month. So it can also be used to learn those skills. After the story, there is a study guide, which does get into some pretty advanced grammar concepts concerning nouns and adjectives, such as the discussion of compound nouns used as adjectives (ice cream dip). The study guide also includes a couple pages of activities. I love having this book as an ebook, just so I can print things off over and over for my kids. Andy reminds me a lot of a cousin I had. She was in a horrible accident when we were ten, and was told she'd never walk. She did use a wheelchair for a while, then a walker, then she went to pushing her wheelchair (Fred was his name) as the chair made a great place to store her schoolbooks. She was strong and determined, courageous in a way I never could be. Unfortunately, my kids never got to meet her, as she died a couple years before my oldest was born. So one of the things I really appreciate about this book is how Andy is a real person, with hopes, dreams, difficulties... and he is strong, determined and courageous too. 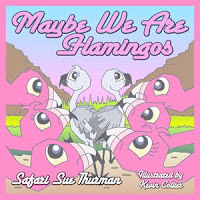 Okay, so next is Maybe We Are Flamingoes by Safari Sue Thurman. Oh, this one was just cute. The basic idea is that these little white, then grey, baby birds look around at all the pink adults and think they are in the wrong family. They (and we) get a lesson in why flamingoes are pink, and what flamingoes eat. And the two adorable little birds get crazy, drawing all kinds of fantastic pictures of what they might look like if they ate other things instead. You know, like tacos or pineapple. My children adored this book. Fifth on the list... Earthquake by Susan J. Berger. This one certainly has an older audience, filled with lots of detail, statistics, maps and diagrams. 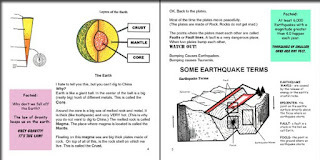 It is written in a very kid-friendly style, and could be read to younger children, especially if you live in an earthquake prone region. I'd just skip over a lot of the factoids (little boxes where a lot of the statistics type details are included). The publisher recommends this for ages 6-9. One thing I really appreciated about this book was the idea of preparedness. We do not live somewhere that necessitates us preparing for earthquakes. But much of what is in this book applies to us still -- like life without power. We got some new ideas for ways to prepare for our situations, plus just the reminder that preparedness may look a bit different from one place to another (we really don't need to be concerned about having pictures over our bed), the basic ideas don't really change. 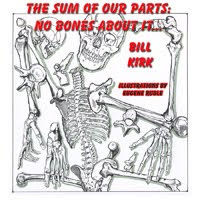 Last, but not least, we read No Bones About It by Bill Kirk, part of the Sum of Our Parts series. My oldest son loved this book. It teaches the names of the bones, from bottom to top. This one is suggested for ages 8-13. There is a ton of information in this book. The main part is the rhyming text, naming the bones from the bottom to the top. But this book also has factoids on virtually every page, and those talk about the minerals that make up our bones, or that the bones produce red blood cells, or the types of fractures. Overall, the ebooks from Guardian Angel Publishing were a lot of fun. From looking over the site, it appears that all ebooks are available for $5, but the books are also available in traditional formats for around $11. This is just a small sampling of the books they have available. Check out the alphabetical list of titles on their website.